Mary Sanders and her granddaughter, Kelley. Mary Jones-Sanders bought her home on Bewick in Detroit in 1975. This has been her home for more than 40 years. She has raised children, grandchildren and great-grandchildren in this home. Ms. Sanders will be 80 years old this spring. 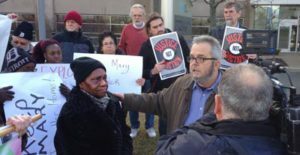 With support from Detroit Eviction Defense, Mary Jones-Sanders bought back her home from a California investor who had planned to profit from it. Because Ms. Sanders is living on a fixed income, she should have gotten a poverty tax exemption. But no one told her about it. Eventually she scraped together enough money to pay the taxes. Her home was sold at the fall, 2015 tax auction anyhow, because she didn’t realize she also owed $600 in fees. Mary Sanders (left) and her lawyer (right) after discussion with the California investor who bought her home. It was snapped up by a California investor for $2300. He at first insisted she’d have to pay six times that amount to get her home back. But a February 3 2016 protest at the investor’s management company in Ann Arbor and won news coverage on Michigan Public Radio. Within days, the investor agreed to sell Ms. Sanders back her home at a price she could manage. 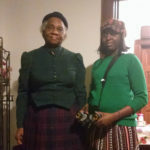 United Community Housing Coalition immediately offered her a loan to buy the house, and Eviction Defense hosted a fundraising event to help her with the payments. Any Detroiter over 65 and in financial difficulty should immediately be handed the poverty exemption paperwork. How many long-time residents are kicked out of their homes because the city and county fail to tell people about this option? Listen to her story on Michigan Public Radio here.